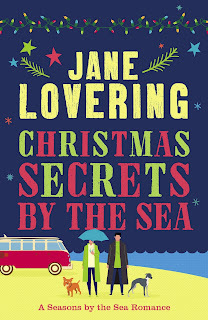 I am so pleased to welcome Jane Lovering's Christmas Secrets by the Sea to the blog today. It was published by Farrago on 13th December 2018 and is the first in a new series, Seasons by the Sea. Although Christmas arrives at the end of the book, the majority of this novel is set in the run up to the festive season so it is not an out and out Christmas read. You could read it at any time without feeling that you are reading it 'out of season'. I particularly enjoyed how the two main characters of Tansy and Davin's characters are gradually revealed. With both of them, what you see is not necessarily what you get and they both discover some deep-seated issues which they hold from the past. Being given an insight into both of their state of minds really lets you get to know them both. There is plenty of humour within the story, principally coming from the two little canine buddies of Brian and Seelie but also from some of the over the top characters who are part of the filming. I enjoyed the passing references to the fans who follow the film dramas such as Poldark and the author takes a rather playful dig at their fanatical ways. Being on the coast, the sea and the weather have a fairly major part to play in the plot and the setting on the Dorset beach is set up nicely for the rest of the series. The romance when it emerges is a muted affair compared to the friendships which develop as characters learn to face up to their pasts. In short: An engrossing read which alternates between humorous and emotional moments. Jane writes comedies which are often described as ‘quirky’. 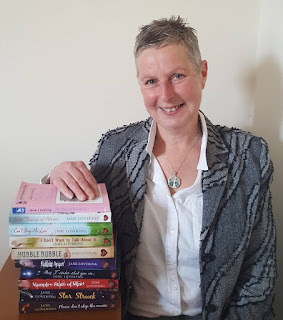 Her debut, Please don’t stop the music, won the 2012 Romantic Novel of the Year and the Romantic Comedy Novel of the Year Awards from the Romantic Novelists’ Association. Jane won the RoNA Rose (Love Story of the Year) Award 2017 and is shortlisted for the RoNA Romantic Comedy Award 2018. You can read my review of Living in the Past here. Thanks to Jane Lovering, Farrago and Fanny Lewis of Farrago for a copy of the book and a place on the tour.